Elmark is a single source supplier of all of your shrink sleeve labeling and tamper-evident banding needs. Elmark is proud to be the Mid-Atlantic/Northeast distributor for American Film & Machinery (AFM), a leading manufacturer and supplier of heavy-duty shrink sleeve labeling equipment, shrink tunnels, and shrink sleeve consumables. 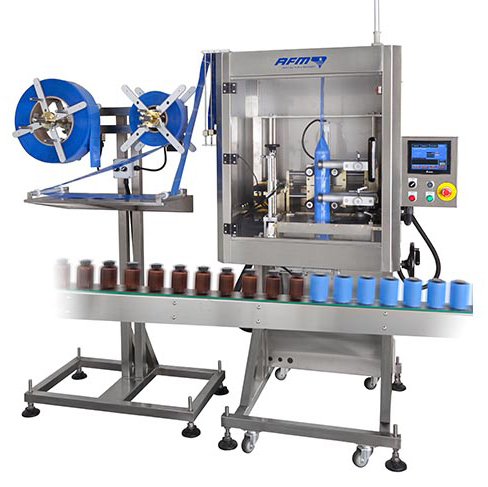 AFM’s shrink sleeve labeling equipment includes a complete line of shrink sleeve labelers, tamper evident banding equipment, steam tunnels, electric tunnels and infrared tunnels. AFM’s labelers range in performance from 50 to 600 products per minute, offering a product and price point no matter what the application demands.